“The people of this state do not yield their sovereignty to the agencies that serve them. The people, in delegating authority, do not give their public servants the right to decide what is good for the people to know and what is not good for them to know. The people insist on remaining informed so that they may maintain control over the instruments that they have created. This chapter shall be liberally construed and its exemptions narrowly construed to promote this public policy and to assure that the public interest will be fully protected…. — Preamble to the Washington Public Records Act, approved by voters in 1972. Will Gov. Jay Inslee stand with the people of Washington state — or will he bend to the worst impulses of legislative leaders who think they know best? Inslee has until midnight Thursday to veto Senate Bill 6617, an utterly flawed bill that passed both houses in the most cynical of rush jobs. In an interview Thursday morning, Attorney General Bob Ferguson expressed concern about the process. “The right thing to do is veto the bill in its entirety. Period,” Ferguson told a member of the editorial board. The bill would exempt the Legislature from the state Public Records Act and make a few records disclosable, such as communications between legislators and lobbyists but keep many private. On Jan. 19, a judge ruled that the Legislature had been acting unlawfully by denying records the act says lawmakers must release. 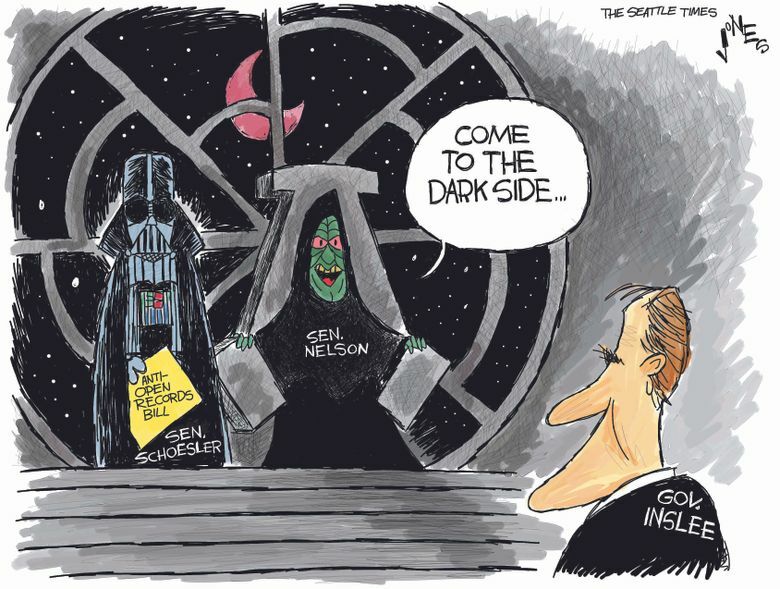 The public saw through the Legislature’s attempt to seal its records and have been calling and emailing the governor and lawmakers by the thousands, after The Seattle Times and 12 other state newspapers ran front-page editorials urging the governor to veto SB 6617. The governor should veto the entire bill — for exactly the reason stated by the committee’s resolution. Legislative leaders introduced this bill and jammed it through both houses in under 48 hours last week — skirting the committee process with no meaningful hearing or debate on the House or Senate floors. Yet, that is exactly what Senate Majority Leader Sharon Nelson and Senate Republican Leader Mark Schoesler said in sponsoring this bill that flouts the judge’s ruling, the Records Act and does so in a way that shamelessly demonstrates contempt for public process. A government that thinks it knows best is the worst kind of government. Even though the bill passed with a veto-proof majority, the governor should veto the whole bill and work his connections with legislators to stand down and not override. It is the right thing to do — respecting the right of the people to know how their leaders are — or are not — serving them.